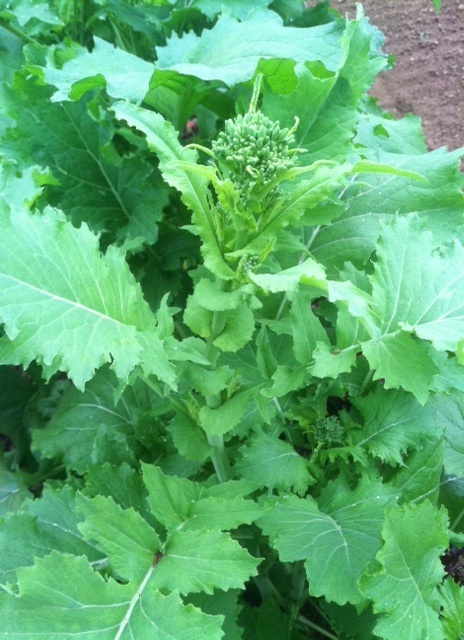 Brassica rapa, otherwise known as rapini or broccoli rabe, is a member of the mustard family. It is known for its bittersweet foliage and flowers, and is a staple in Italian American cooking, particularly in the Northeast and Mid-Atlantic states. The leaves are quite tender, and are delicious when sauteed with olive oil and garlic. The stems can be a little stringy at times, but soften up nicely when blanched in boiling salted water or braised with garlic and a little chile flake. If you find that the stems, once cooked and tender, still have a little stringy-ness, just cut in little pieces across the stem and toss them with the leaves. Probably the best preparation (in our humble opinion), is broccoli rabe and sweet sausage tossed with garlic, oil, penne, and parmesan. Or you can blanch, chop, and add them to a frittata. And of course there’s absolutely nothing wrong with eating them on their own with a piece of sourdough bread and a fried or soft-scrambled egg. And a slice of mozzarella. Boun appettito.